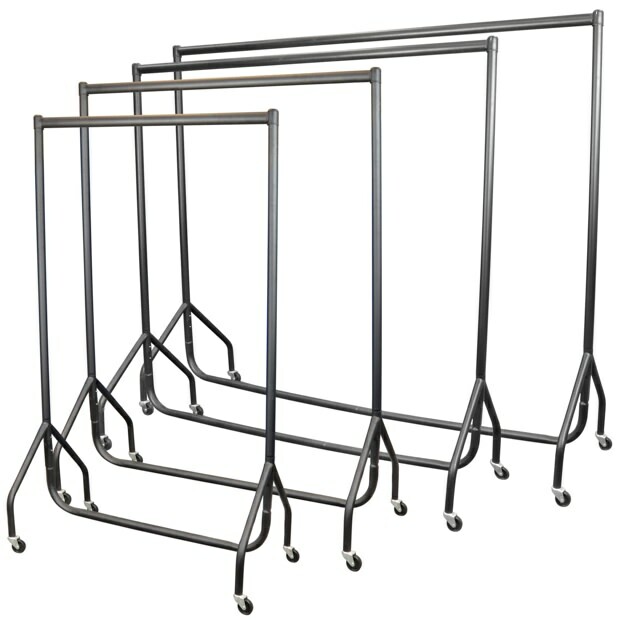 Flat-packed, black clothes rail on castors. NO TOOLS required - 4 easy parts click together. Lightweight, strong and quick to assemble and pack away. Extremely durable with its black coated metal frame. Perfect retail outlets, market & carboot traders. Also ideal for as an extension to your wardrobe or cloakroom at home. A versatile and robust item - ideal for commercial, domestic and executive settings. Size: Width x Height: 3ft x 5ft (91cm x 152cm) approx. 4ft x 5ft (122cm x 152cm) approx. 5ft x 5ft (152cm x 152cm) approx. 6ft x 5ft (183cm x 152cm) approx.